Hey all you Spokane County Paramedical types, the owner/operator of Paramedic Protocol Provider just emailed me to say that Spokane County's protocols are now available in this iPhone/iPod touch application. This has been in the works for months. Here's more. John's brother made this website and it is excellent. We still have the account at the credit union, but there's an easy way to donate via PayPal on this website too, a blog and a lot of great stuff. John is always in our thoughts and prayers, and this website is great not only for John but for those of us who know him. It's not the same as being with him on-shift, but it's still very good to check out. NARRATIVE: The Spokane City Fire Dept. responded fire apparatus and fire fighting crews to 2217 E Sprague Avenue at 0533 in the morning on Tuesday March 16, 2010, for a reported structure fire. Fire crews responding to this incident reported smoke coming from the structure. The first arriving fire crew reported a one story wood/frame dwelling that had been converted into multiple apartments. They reported fire in the southwest corner of the building. Assignments were made to the other responding fire companies by the officer of that first arriving fire apparatus and as those companies began arriving on scene the crews went about undertaking their assigned tasks. In an aggressive and coordinated effort, fire attack hose lines were advanced into the structure at the same time that other firefighters, on the roof, were cutting vertical ventilation holes in the structure's roof. Other crews were sent inside to pull ceilings, open up walls and search for any possible victims,. Four residents were removed from the structure. Other personnel were assigned as back-up for the crews inside. A fire crew was also assigned as the "rapid intervention team"; a safety mandated unit that is available for rescue of injured, lost, or trapped fire fighters. 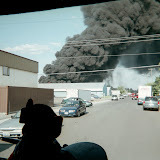 The quick attack of Spokane Engine 7 extinguished the main body of fire. While the extinguishment of the fire was dramatic and quick the fire still caused serious damage to the involved apartment. Once the fire had been darkened down the labor intensive task of overhaul began as fire fighters went about digging out the hidden fire from those concealed spaces that are inherent inside of every structure. Fire damage was mostly confined to the involved unit. There was also some smoke damage and water damage to apartments on the main floor. The electrical supply to the building was disconnected, by Avista Utilities because of the damage. Red Cross representatives were requested to the scene and they were in the process of assisting the tenants with temporary lodging and supplies. There were no reported injuries to any of the fire fighters at the scene or the tenants of the dwelling who were able to get out safely along with their pet dog. Investigation into the cause of the fire is being conducted by a member of the Spokane City Fire Dept. 's Special Investigation Unit. DAMAGE EXTENT: Smoke and Fire damage to the involved unit. Moderate smoke damage to the other first floor units. Minor water damage to the structure. Ventilation hole through the roof. Extinguishment/search for fire extension damage to first floor units, attic and roof.